Been quite some time since I last posted on here. Been with Virgin for a while and it's been mostly ok until late last year. Seem to be getting occasional upstream congestion, which of course Virgin aren't interested/bothered in sorting out. The contract period has now finished so thinking of moving to a VDSL connection, probably with AAISP. Looking at probably the Home::1 1TB package. Question I have, is whether an engineer would move the master socket at the appointment? Going to need a new line install. The master socket is currently in the hallway, which isn't convenient as there isn't any power sockets close by. Ideally, I'd like to have it moved to a upstairs bedroom at the front of the house. Would the engineer be able to extend the current phone line, run the cable around the front of the house, drill a hole and then mount the master socket above the Virgin face plate? If you're paying for a new line installation, not just to start a stopped line, then that used to cover for the option of relocating a master socket within reason. As long as it's not too time consuming or difficult for the engineer then they should be able to relocate the master socket. I did this once at a previous address, the engineer moved it from the lounge to the front bedroom upstairs. In my case the drop wire was overhead at the front of the house, so the engineer just cut the cable downstairs, drilled a hole in the wall upstairs, rerouted the cable through that hole and cut the appropriate length as it was a bit too long. I don't know what an engineer does when the cable is too short, perhaps they use a junction box or something to join a new cable on to the previous/drop cable? Sorry I can't be of much more help, but someone like Black Sheep would know I imagine . As for AAISP, I would highly recommend them. Their support is top notch, I recently had line bonding from them. I’m guessing that it would need a new line installation, there’s no dial tone when a phone is plugged into the master socket, so I guess that the line was disconnected at some point once the move to Virgin was done. The line is underground but I’ve no idea if there is any ducting or whether it’s direct burial. There is a BT chamber right outside the house in the pavement, don’t know if that would have any bearing on how easy things would be? Every job is bespoke .... don't get me wrong, there'll be a large element of 'samey' on each task, but every single customer (EU as they are referred to these days), will have their own idea of what should go where and how they would like it done. Some don't give a flying .......... other's scrutinise your every move. So each job has to be assessed differently and with the EU's preferred aesthetics taken into consideration, and applied if possible. With that in mind, on more than one occasion I've had EU's refuse to have another hole drilled into their brickwork and yet another socket fixed to their internal wall, when a perfectly good one already exists, with a perfectly good wire going all the way back to the VM box situated on their outside wall. So, the best way to provide the new line was to run a cable from the BT66 (BT's own outside box where the underground cable is sited), a few metres to the VM box and connect to the existing cable running to their master socket. Then, simply change the front plate from a VM logo NTE to an Openreach one, and voila !!! No fuss, no mess and one happy EU. The only point of note is that our auditors (if we get the truly pedantic one, of which there are many), may turn around and boll0ck the engineer for putting a 'joint' in a non-approved closure' (ie: VM's outside box). Of course, there is nothing wrong with VM's box as it's been watertight for the length of time you've used their service, but this is the world we operate in today !! The icing on the cake of course, is if VM's wire from the outside box to their master socket, actually went past BT's outside box .... it would then simply be a case of diverting it into the BT box and job done. Hope this makes sense ?? Thanks for the reply Black Sheep. Unfortunately, there isn’t a BT66 on the outside wall. The phone line appears to come up from underground and enters into a void in a wall between the hallway and downstairs toilet. The Virgin phone socket is actually sited directly above the BT master socket in the hallway. My apologies .... I didn't read your OP fully and correctly. I assumed the VM socket was already upstairs. If you still require it upstairs, then obviously the engineer will have to connect the cable at where the void is, and 'run it' upstairs. How this will be done I have no idea, as I obviously don't know your property and its lay-out ?? The residential installation task raised by CP's/ISP's, carry a bog-standard 1hr TRC (Time Related Charges) banding. In other words, if the task at hand looks like it will take longer than an hour, the engineer will pass it back to the CP/ISP with notes saying as much, and requesting a higher TRC band be applied to the job. I've attached a annotated pic of where the existing BT master socket is and where I was hoping it would be relocated to. I don't mind having to pay the £140? fee for a relocation if needs be. If the existing master socket is mounted on the external wall then there is no reason why you couldn't simply drill through the wall and run the cable up to where you want. You could even use a data extension and simply extend it yourself and use an appropriate socket the other end. Thinking about it, that would certainly be an option. I wasn’t sure if using a data extension kit would affect potential sync speeds. But I guess it wouldn’t be much different to just moving the master socket. Would an engineer be happy with drilling through walls to fit it? A quick search seems to suggest its only run internally? Would be a shorter run if it was done externally. Think I should perhaps send the pic to AAISP sales and see what they suggest perhaps? Just to mention that you could always get a better quality roll of cable for the extension if you wanted, to minimise the loss, not the standard cable that Openreach would use. Order placed with AAISP, sales confirmed that as I was ordering a new copper pair, then the engineer should put it where I would like it. We use Cat5 2pr UTP for data extensions ................. methinks you're thinking of a 'voice' extension, Ixel ??. Just had a look at the AAISP control panel and liking the detail of the order process. Just a quick question. There’s quite a few entries for “Test line called (N)”. Anyone know what that means? Yeah, I was probably thinking of a voice extension. I was thinking as long as the cable is twisted pair and not flat. Even better, a twisted pair and shielded cable if it's going to be run near any potential sources of interference indoors. The AAISP control panel is quite something. You know pretty much everything that's going on regarding a fault (e.g. what the AAISP staff are doing, or the engineer notes) or actual details on how an order is progressing. "Test line called (N)" usually happens when the frames engineer is doing their bit for your order. You may see something like this a bit later after that's happened: "Message: Warning 575 Notification of completion of frames activity". "Test line called (N)" happens whenever the voice side of your line becomes used. If you end up trying to use the phone on that line, after the service is live, then you'll find the control panel will say "Test line called (Q)" instead. I assume Q means 'quiet line test' while N perhaps means 'network' or something else. You'll hear a pre-recorded message which I think is Adrian Kennard's voice, not sure though, saying the circuit ID or such message and then "quite line test" for a few minutes before it will eventually hang up. Even though AAISP classify their copper line product as 'data only' they still have to send something down the voice side so that an engineer doesn't accidentally take your pair of wires (thinking they aren't in use) and subsequently use them for somewhere else, as far as I know anyway. SoGEA may replace this one day. While I hope that you never get a fault on your line while with AAISP, rest assured that they won't sit around when a fault does occur! They were very prompt when I had a strange problem at my old address, which is why I moved from Zen as nothing seemed to happen really there. Credit to Zen though, they eventually let me leave my contract early and even refunded me what I had paid from the contract start date. That's what I call excellent customer service. Anyway... back to AAISP. They even fixed a minor issue I had recently with my bonded lines, they know their stuff. I actually left a review detailing my experience regarding how they handled my odd problem if you're curious and want to read about it - https://www.ispreview.co.uk/review/reviews/6797.html - bear in mind this review is about my old address's line. They were on TalkTalk Business's tail, as TTB I imagine were on Openreach's tail . One of the SFI engineers who arrived if I recall correctly actually commented saying that my provider must have a good contact at Openreach or something like that haha. After the case was escalated (second engineer onwards) they were doing all sorts, pair swaps, lift and shift, D side inspection, port reset or such. The final engineer had to return the following day as he was here for a long time, he looked for the best possible connection along the route my line took (which took him a while). Thanks for the explanation Ixel. 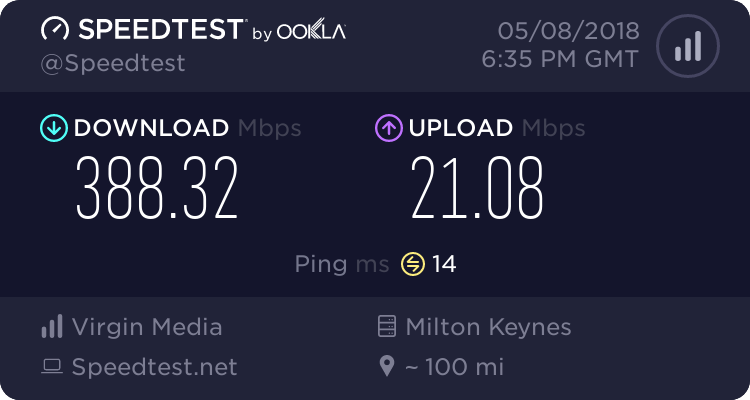 Seem to be doing plenty of work then, unless it’s just normal amount for a new connection. Seems as though going with A&A was the right choice, going off your experience with them.